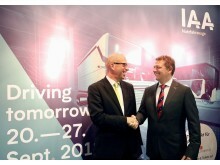 Jens Zeller (Managing Director idem telematics GmbH) and Marco Reichwein (Managing Director Cargobull Telematics GmbH) seal their strategic cooperation at the IAA Commercial Vehicles in Hanover. 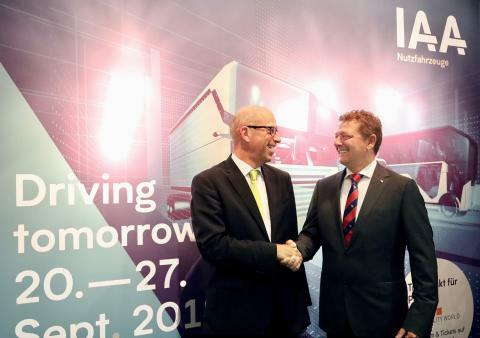 Hanover, 24.09.2018 --- Schmitz Cargobull and the BPW Group announce a strategic cooperation in the field of telematics at the IAA Commercial Vehicles: In future, data can be exchanged between the "cargofleet3" telematics system of BPW subsidiary idem telematics and the new Schmitz Cargobull TrailerConnect® portal via a common interface. At the customer's request, the data from both systems can be integrated into the respective portals and clearly displayed. Digital data and temperature management are basic prerequisites for the logistics of the future. For this reason, Schmitz Cargobull will equip all refrigerated semitrailers ex works with TrailerConnect® and a certified digital temperature recorder as standard equipment under the motto "100% Smart". 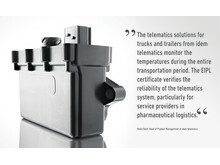 "Telematics systems from a wide variety of manufacturers are now in use in almost all fleets. By opening the interfaces and integrating the data into their respective portals, the market leaders Schmitz Cargobull and idem telematics are responding to the customer's request for all fleet data to be displayed in one interface. 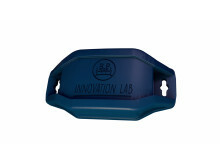 This enables a significantly more efficient and simpler fleet management. Two partners, who stand for the highest data quality, are now cooperating to achieve this. "Simple handling and overview of the own data on a view are a standard, which we would like to offer to our customers in the future together", explain the managing directors Jens Zeller (idem telematics GmbH) and Marco Reichwein (Cargobull Telematics GmbH). 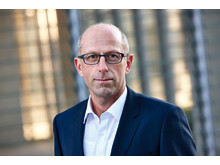 "With this co-operation we set a further milestone in the conversion of the 'Internet of Transport'", says Jens Zeller. The strategic cooperation will be implemented at short notice. 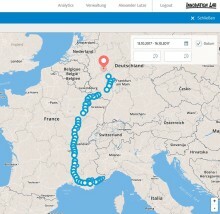 Schmitz Cargobull and idem telematics are planning to integrate data from other systems into their own portals in future at the customer's request. idem telematics will present its solutions at the IAA Commercial Vehicles (20 - 27 September in Hanover) at the BPW Group trade fair stand, Hall 26, Stand C31, Schmitz Cargobull can be found in Hall 27, Stand F 26/37. Cargobull Telematics GmbH, based in Münster, Westphalia, is a 100% subsidiary of Schmitz Cargobull AG and the market leader in trailer telematics solutions with more than 20 years of experience in the market and more than 50,000 installed units. Cargobull Telematics offers an extensive product portfolio including services, in particular in the area of temperature-controlled transport to both vehicles of the manufacturer Schmitz Cargobull, and as a retrofit solution. 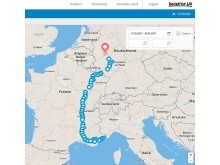 In January 2018, the new TrailerConnect® 2.0 portal and the new TrailerConnect® CTU3 telematics hardware were presented; in September, the manufacturer Schmitz Cargobull announced that in future all refrigerated semi-trailers would be equipped with a CTU3 including 24-month portal access as standard. 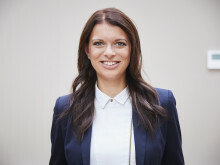 The core business of Cargobull Telematics GmbH is the continuous improvement of business/logistics processes and the support of customers in digitisation. The market-leading telematics system for trucks and trailers from idem telematics with its cargofleet3 portal, has now been upgraded with a novel swap body management and security offering. 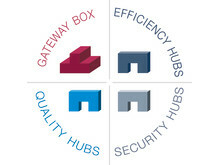 Enhanced security is provided by an invisible digital seal, and the new system simplifies management of both swap body fleets and their depots. Is digitisation leaving small and medium-sized hauliers behind? The fact is that around 85% of trailers on the market have no telematics and are missing a digital connection – faxes, paper trails and constant calls to drivers and dispatchers are still part and parcel of day-to-day work, even in 2018. The BPW Group now wants to change that.